I added it to my growing list of books read from cover to cover in my reading list. 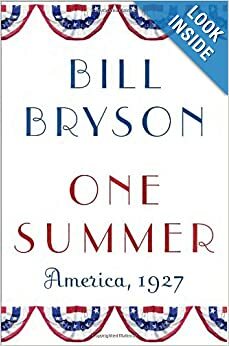 Bryson is a humorist but this is great history, readable, ironic, fascinating. Hooray! I’ve uploaded two posts on the schools today. I’m bushed. I’m finding a whole new reason to get on the computer. Its replying to letters (emails really) sent to School Board members on the ISD709 email site for School Board members. I’ve spent an hour on it today and I’m guessing that may end up being pretty routine. I believe people who write to their elected officials should be acknowledged. Its true that the same mail goes to seven board members and that emailing is so easy that we are getting vastly more communications than I got ten years ago when I last served on the Board. That doesn’t change my convictions about a written reply. Several of the folks I’ve replied to have sent me thank you’s even when I didn’t agree with their point of view. Its the communication that is the most important to most of them. NOTE I just went on the email and saw that so far in two weeks I’ve written replies to 66 emails. In addition I expect to meet with people and make phone calls as well. Some phone calls can go on for a long time as I’m a pretty garrulous fellow and yesterday I had a meeting over coffee with a couple folks that lasted nearly three hours. I’d like to say more about these events but I’m still tippy toeing so as not to throw fear into fellow board members and a little burned out at my replies to email. There are three or four I’d like to post sans names to show how I communicate and what items are of interest to those sending us emails. But the computer’s glare is intense and my shoulders are still rebelling to me from a recent bout of snow shoveling. I love being on the School Board. Our problems are vast. Don’t expect happy talk from me. Look for mischievous straight talk. Does that sound like contradiction? I don’t me it to. This story from the Timberjay is a little old. I meant to post a link to it some time ago. Duluth is not the only district still reeling from the work Johnson Controls did rebuilding the school district. The St. Louis School District, a vast rural district including many former small districts that were cobbled together decades ago in a spate of consolidations, is considering splitting in two after JCI’s work. The northern half has been particularly outraged at the outcome. Those interested in seeing other stories about the crusading Timberjay’s attempt to ferret out public data from the giant corporation and the school board can check them out here. I forgot that Karl Schuettler makes occasional bloggy comments on the School Board. At the end of the meeting he told me he would write about the meeting and I asked him to send me a link to his commentary. Karl wrote a good summary of our recent school board meeting. For those who can’t bear to sit through our televised meetings but curious about what took place in a a nutshell they’ll do better reading Karl than the DNT. DNT articles aren’t set up to be comprehensive but generally focus on one or two items on our agenda. For instance, the DNT story focuses on our acceptance of the Ojibwe language immersion plan. This followed their coverage of the same story the day of the meeting anticipating the discussion on the immersion plan. It was an excellent before and after story but we had a lot on our plate, two hours worth. Karl is a graduate of Duluth East and went to Washington DC where he got a degree focusing on International Relations. And he’s a hockey fanatic. I won’t hold that against him and, in fact, I’m heading to tonight’s big sectional final between East and Elk River at the invitation of East’s AD Shawn Roed. Go Dogs! uh Greyhounds! Same thing, right? Its not just stealth that has kept me away from Lincoln Democrat but busy as a beeness. 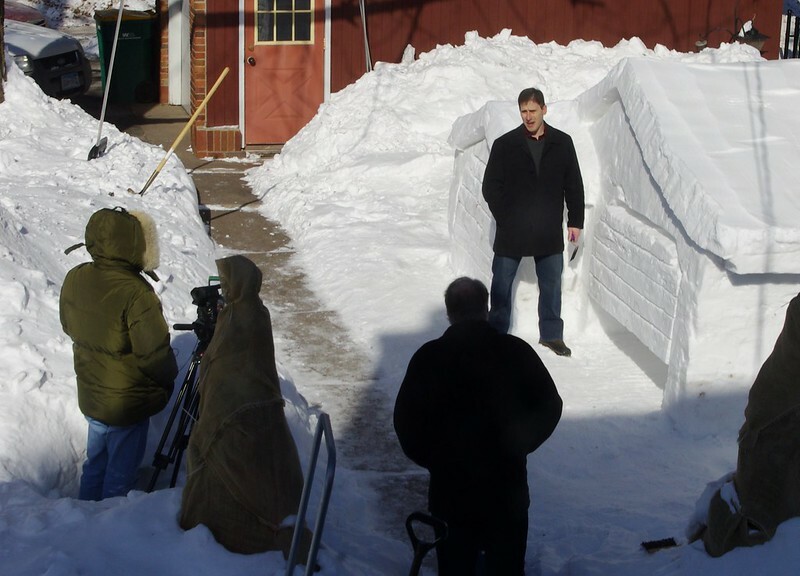 I agreed a month ago to build a garage out of snow for a commercial for Town and Country garages. I did the same thing a number of years ago and they wanted to reprise the ad. I spent a large part of two days piling up snow in my back yard up over my head and got the rough shape completed when we got that 14 inch snow dumped on us. I spent even more time shoveling that off my driveway and sidewalks. Sleeping has been a real pain in the neck for a couple days. No pillow has managed to soften the blow. Well, I’m sort of recovering. Just took one advil this morning. The photo shoot was over by eleven AM. I hope my ad generates lots of business for them so I can collect my small remuneration. Sore shoulders have given me one other excuse for staying away from the keyboard but I’ve had to return to it to answer a dozen or more recent emails to my School Board email account with the District. When I first managed to get in after a week of struggling to get a password straightened out I found 92 emails to pour through. I like responding to emails but I gather that other Board members have shunned the practice. I know nothing frustrates constituents as much as getting the sense that elected officials are ignoring them. I don’t even think that they care whether Board members ultimately agree with them. They just want some sign that their concerns have been heard. Most of the recently snow flurry of messages concerned snow days. I found myself saying much the same thing over and over. …as if I have to tell my loyal readers that. The road to hell…….. I think I’ve had no fewer than three posts in mind every day since I stopped posting regularly after the election. The problem is that if I’m not careful I could end up causing more harm as a new school board member than good and that would be profoundly disturbing. Trust is a very hard thing to reestablish and I can assure my loyal readers that the rather cavalier way I have of explaining what I see and how it strikes me could put my fellow board members in a sour mood. That would not be helpful to anyone. In time I will likely grow more confident about trust issues and be back to my old blogging self. In fact that distressing 67% figure was one of the top ideas I wanted to post about. Lining all of us school board members up against a wall ans shooting us for it did not seem all that unreasonable. Maybe we can even keep improving and get to the 90% goal that the state has set for us. I’m pretty sure we achieved it ten years ago when I stepped down from the Board. According to the story ten years worth of graduation data has been gathered together by the state. I hope Duluth’s Administrators have access to it because I’d like to know when and where we went wrong. This post will be edited sometime later this morning to clean it up a bit. I’m listening to NRP radio as I type this. I’ve been out of bed for an hour and the long post I imagined typing up may be truncated as I head into another busy day. I was trying to remember the meteoric steps that Teddy Roosevelt took on the way to the Vice Presidency when I woke up. law school, the legislature, Civil Service, Police Commissioner of New York City, Asst. Secretary of the Navy, Rough Rider, Governor……at least that’s what I recall from reading the first third of Doris K Goodwin’s marvelous book Bully Pulpit. Then I tried to remember the path George Herbert Walker Bush took on the way to the White House. He was described at the time as having the resume fit for a President. But what woke me was the health of the Duluth Schools. At seven this morning I’ll work on that by meeting with fellow new Board member Annie Harala for breakfast. We’ve been threatening to have coffee since the MSBA conference in January. This week we had already set and broke two meeting times. Those of you looking for my traditional spilling of the beans are going to be disappointed again. I’m still pursuing my Grandmother’s BYC policy so as not to muck up the opportunities I’m beginning to see for us to thread my way through a minefield. Over the summer I formed an early impression of Annie. She’s my kid’s age and she went to Chester Park with them. That difference in age put me at risk of regarding her in a patronizing attitude. There was no doubt she was eager and enthusiastic. She was also so green she didn’t want to risk making anyone mad at her by hinting at any agenda she might be taking with her to the school board. That combination of characteristics and her freedom from having any annoying past political history trailing behind her gave her the highest vote totals on election day. The jury, my jury, was still out on Annie as she took office. There is no question that on a reduced school board of seven people three of them new (if you include me) she would play a significant role. As such there is little doubt that she will be courted by all the rest of us with agendas. The first thing I can assure my readers is that Annie seems intent on figuring out for herself what needs to be done. At our few school board meetings so far she has been effectively businesslike asking good questions and losing herself in intelligent inquiries. This was true of the recent Education standing committee which she was named chair of. That meeting lasted over three hours and even though it appeared she had been coached to hurry the meeting up she didn’t let other’s impatience get in the way of our questions. Afterwards the Superintendent commented that he will probably have to make our agendas shorter so that committee members. I hope he doesn’t. Three hour meetings were not unusual when I first served on the Board. Its just that in recent years no one has asked questions. BTW, I consider that an indictment of the old Board. Annie has learned a couple things about me as well. She commented favorably about my interest in the Ojibwe immersion classes the other day and she was impressed to hear that I would be volunteering at Lifehouse this afternoon. She herself spent a year or more supervising recent college graduates who were teacher interns or something like that. As such she is one of the cheerleaders for new blood and new methods in the classrooms. I’ve met with Art Johnston for many hours and had many other long conversations with him as well. I haven’t had the same chance to cultivate other Board members in the same way. However, in previous posts I’ve outlined my long history with most of the other Board members. Annie has been the biggest unknown although I have known her mother, a Duluth teacher, for twenty years. I won’t have much more than an hour with Annie this morning. I’ve got twenty hours of things to discuss with her so the best I’ll be able to do is lay out a thin veneer. I’m not in any rush. What I want to discuss with Annie needs a thorough vetting with all of the other Board members. I really don’t like the word I used earlier, “cultivate.” That suggests a level of grooming that I don’t intend. What I have to do is plead that Annie keep the open and curious mind that she has shown so far. That will mean that she must treat me with the same distance and skepticism I would wish her to maintain with all other members of the School Board. I really think this school board has some unique skill sets and history that could help weather some really bumpy weather. The Superintendent is a key and I have been watching him with interest too. I’ll be frank here. The superintendent has a great reverance for Keith Dixon. I loath the Dixon legacy. That is a considerable gap to bridge. But I know that the blind men groping an elephant can’t help but see the beast (or feel rather) in unique and varied ways. Keith Dixon is only a historical artifact for me at this point. Bill Gronseth is real presence. I’ve attended about seven of the recent Think Kids meetings he organized. I got used to his canned message and jokes much like a reporter following a Presidential candidate across the country. Those poor reporters have to endure hearing the same canned speech over and over again with the prepared jokes and pauses for applause. “I wouldn’t have done it”, Rosie whispered back. I’f I was speaking this into my phone now the hahaha feature would have kicked in. I have some delightful people to work with. It was windy and cold outside and no one seemed any too eager to go out into the cold. After I had tarried a while the Superintendent headed out with a plastic container of his handouts. I mentioned that my wife was off to the cities that night at seminary and he mentioned that he was a lay Methodist minister. I told him I was an agnostic who had been a twenty-year member of our Presbyterian choir. He explained that he now attended a Lutheran Church. I asked it that was the influence of his wife. He avered that this was the case. If I can just bat away my deepest suspicions there may be a time when I’ll walk out on a dark night with my fellow Board members and find myself saying, “I think this is the beginning of a beautiful friendship.” That’s certainly a more hopeful line than “Fasten your seat belts, its going to be a bumpy ride.” I wouldn’t be surprise to find that both of these Hollywood lines apply to the next four years. All seven of us went to the School Board conference last month. That is the most hopeful indication that we are of like mind no matter how unalike we are. OMG. I can’t believe how great my Samsung cell phone is. At the end of the last paragraph are all the “hahas”. They really are ha ha’s because after reading that first paragraph back with its mistranslation of “below zero” as “formula 0” I started laughing. At least the phone got that right. I knew I would have to get one of these phones about a year and a half ago when my son talked into his Android to Google something. Right now I’m dictating into mine in lieu of typing on my computer which is currently keeping me at arm’s length updating itself. While I waited I headed to the kitchen to brew some coffee and mix yogurt honey and fruit together. My patio thermometer registered 3 degrees below zero. It dropped another degree to 4 below before I had finished my pre-breakfast. That pleased me because the Duluth is about to set another weather record. We already broke the record for the number of consecutive below zero days. I think its now 22 days. Now we are about to break another cold weather record that was set the year Claudia and I moved to Duluth from the winter of 1974-75. That year we had something like 52 or 59 days that went below zero. A couple days ago we were three days short of that record. Now we are two short of it with lots of winter still ahead of us. My primary measure of a cold Duluth winter is having Lake Superior freeze over. That’s happened a couple times. 15 years ago or so I walked about a mile away from the shoreline over the ice following a skittish Fox that wasn’t too keen on my tracking him. That first year in Duluth got off to a cold start. Claudia and I spent the night in a tent that August in Jay Cook Park before scouting out a new home. The next morning its canvas was covered with frost. This post wasn’t going to be about the weather until I read that “formula 0” and got my hahahahahas translated. BTW, th hahas in the last sentence are fake laughs. I guess a smartphone is only so smart. As I explained this post came about while I waited for my computer to update itself. It has been extensively edited since its first posting because it was a bit of a muddle. I’m keeping it because I like the anecdote about the weather. Now that the computer is available again I’m on the the post that filled my head upon getting out of bed. So much I’d like to write about not even counting the account of Charter Schools which is still circling the airport waiting to land. I’ll stick to a safe snippet from today. I was scheduled to read at one of our schools this morning. As I headed to the Interstate I saw I was blocked by the police. I figured it was an accident that was plugging up the works. It was still there when I returned from reading an hour later. Today’s six inches of snow or so caused a 20 car pile up under the Bridge near Fitgers. Fortunately I left half an hour before my mission and got to the class just about on time. I should have had ten minutes to spare to check out one of our new elementary schools. It truly was beautiful but the office staff member who showed me to the room took the chance to lobby a school board member by telling me it sure would be nice to build a new wing onto the new school. I riposted that I’d be glad to get more playground space and my guide averred that this would be nice too. Here is one of the many eye poppers in the wake of the Red Plan. We did our long term planning and yet while the finishing touches are being applied to the last projects we are suddenly on the verge of being over crowded in the elementary classes. Nevermind potential contract increases, unanticipated snow closings and other weather costs but the staff is lobbying for more building. A wing? How much would that cost? How would the public greet this news after grudgingly OKing a levy increase? I had a lovely time reading for nearly forty minutes to a gaggle of kindergartners. They were in the palm of my hand. There teacher requested that I read one of my old favorites Five Minutes Peace which I used to carry in my reading bag. Sadly I had to tell her that it had gone missing in the last decade. I used to lend my books out to Dad’s at a regional correction’s facility to read to their kids and some of the books are probably in NERRC’s library now. In fact, I plan on ordering it soon as I did a few of the other missing in action books. When I left the room after lots of giggles I was asked about whether we could deal with the snowdays by extending the school day by 15 minutes midyear rather than adding them at the end of the year. I shrugged this off by saying it was a contractual question and beyond my current reach. I can readily identify with Mrs. Large in Five Minutes Peace who really wants some time to herself from her demanding children. Except that I don’t. I only want the chance to explain the District’s current situation. I don’t see any easy way to bring our class sizes down much more than the tiny one or two students per class we just managed with the help of the upped levy. A significant class shrinking might cost us more like a sixty percent tax increase even if we held our contracts at the existing level for the next few years. Like that will happen. Once again I’ll plead my need to BYC my cards (see the previous post) to my eight loyal readers. I have some quiet discussions to pursue with my fellow board members one on one. I’m not sure they see what I see and until we agree generally on the condition of the District there can be no remedies such as I am interested in applying. Among today’s tasks is going into my District email account from which I’ve been frozen out for a week. I have about 100 emails to reply to. I have been taping together and color coding three large sheets of paper handed us at Tuesday’s Ed Committee meeting. Each sheet shows one-third of the District’s Administrative positions laid out in a family tree format. Together they show a before and after arrangement of staff reorganization planned by Supt. Gronseth. The biggest change seems to be recreation of a third Assistant Soup in the position of Curriculum Director. This was a position, Department really, that Dr. Dixon got rid of during the Red Planning days. We were told that there are only three existing staffers in what was once a very large department. I’ve yet to meet a lot of the existing staff and so attach names and faces to titles. Even some of the titles have changed in my lost decade. There will be no five minute peace for me for some time to come. I miss Lincolndemocrat, I really do. As I type this its exactly 2:00 AM. I have earphones on with Pandora Radio blasting into my ears at full tilt a work by Gabriel Faure. I can only faintly hear it through the ear plugs I put in after the ten O’clock news to insure a good night’s sleep. Its such a pain getting them in my tiny ear canals that I’m not taking them out so I can get some shut eye again after this early morning visit with my neglected old blog. Small ears and a big mouth. That’s me. I like all my fellow school board members. I can’t help myself. I’ve had serious, soul searching disagreements with at least two of them and yet I like them. Being on the School Board with them has given me a chance to remind myself of just why. For those curious to know which board members I’m referring to I’ll point out that if you really want to figure this out all you will have to do is type each one’s name into the search engine feature on this blog and see what I’ve said about all of them in past posts. It should only take you about five hours to read everything and if you have the dedication for the task more power to you. As for this post I’ll not offer any hints. What a meeting we had. The Committee Chairman Annie Harala called it to order at 4:15 and all seven of us were there before we got too far underway. I was sitting next to Judy with Rosie just past her around the corner of the table where I was sitting. Annie sat next to the “Assistant Soup” Eddie Crawford, as Supt. Gronseth called the position he too occupied only a year and a half ago. Opposite me were Miern, Art and Bill Westholm. I have been amazed at the brevity of the School Board’s standing committees in recent years. These meetings were always a couple hours long when I served on the Board a decade and more ago. During the height of the Red Plan I’m not sure how long they lasted but they were supplemented with constant and sometimes interminable Committee of the Whole meetings. By the time Art Johnston joined Gary Glass on the Board and the Red Plan became a forgone conclusion I think the meetings got much shorter and rancorous but I’m not entirely sure. By that time I didn’t have the heart to sit through one back in the audience. Through the summer I began attending the meetings only to watch them adjourn within fifteen or twenty minutes. With three fresh new faces (if that term can apply to me) on the Board there has been a sea change. We newcomers have lots of questions and now that Art Johnston is no longer alone with his queries all the Board members seem much freer to ask them. With last night’s agenda of serious topics we had a meeting very reminiscent of the ones from my era. It went on for three hours and fifteen minutes. I loved it even though I had to excuse myself a couple times to call Claudia and warn her I wouldn’t be getting home early for dinner. I’d told her I thought I’d be home between six and seven and that was to be after having a cup of coffee with Annie Harala after the Ed meeting that we had supposed would take an hour or so. We probably should have known better. The night before I didn’t get home from the HR and Business Committees until 6:30 after two hours and fifteen minutes. The topics were not presented in the order of the agenda and the first of any length was about our efforts to builds an On-line school. It was an interesting subject but had it been placed at the end of the agenda rather than toward the front would probably not have been given the half hour we spent on it. I plan on taking up the invitation that was offered school board members to pay the project and its teachers a call soon. In fact, on Friday, I will be volunteering at Lifehouse where a number of our prospective On-line students hang out after school. A more sobering presentation was made on our District’s attempts to reign in out of school suspensions. Last year we handed down 1440 days of OSS. Even before the meeting I had marked up the two page outline of the plan with dozen’s of questions. I was not able to ask many of them as other school board members dug into the discussion with questions of their own. That number did sound astonishing to me. It was better than one day of out of school suspension for every seven of our students. That statistic alone suggests that I spend a few thousand words writing about it on this post. Not gonna happen. I’ll just mention the two questions I asked of particular note. Tonya Sconiers, Denfeld’s current principal entered the Committee meeting shortly after I asked the question unaware of the previous discussion. She was busy at the school with one group of students and about to fly away again for some other Denfeld event. I asked her a follow up which threw her off as well. I told her that I had heard wonderful things about how she was dealing with some of these issues. (That was true. Jana Hollingsworth the DNT’s Education reporter had told me Ms. Sconiers was doing some innovative things at Denfeld) and I asked her if she could ask anything of our school board to help fulfill her dreams of fixing things what would she ask for. At a very fast pace she began laying out something like a framework of the things that had been done and that were being planned at Denfeld to deal with these issues. It was like she was going through mental filing cabinets looking through folders instead of reaching for the stars. When she concluded she looked at me and honestly said that as a little girl she didn’t dream much. (I took that to mean that when she saw a problem she simply charged ahead and dealt with it which is very like her personality today) She told me she would go home and do some dreaming and get back to me. I found that a very satisfying answer even if it left me hanging as to how we would address this calamity. By now we were two hours into our meeting and it was time for a new group of folks to make a presentation. The dozen or so advocates for an Ojibwe language Immersion class in the Duluth Schools came forward after their long and patient wait. Once again I will only scratch the surface of our discussion with my small part in it. I gave a short, I hope, peroration just before asking a question in which I said that I was very sympathetic to the class because I was well aware of how the world was losing a rich legacy of some of the tens of thousand languages once spoken. I’m not sure what words to type into the search function to find this but I’m sure I’ve written about this issue on the blog at some length before. To my surprise the Superintendent spoke up after this to suggest if the Board wished he could move this topic from an “information” item to an “action” item. When one of the Board members grew a little alarmed at the prospect of another expense on our impoverished budget Mr. Gronseth explained that it would be modest to place such a program in our schools because it would be like adding seventeen new students which was almost a full elementary classroom and thus actually increase our enrollment. At this one young mother from the audience spoke up and told us near tears that this program to save the culture was so profoundly important that she drove her child to Duluth every day to take part in it. Its hard to argue with tears. I told the Super that it appeared to me that the Board had perhaps surprised him by showing such support and told him I wouldn’t mind this becoming an action item although I was sure there was more negotiating to do to set it into motion. By this time Judy was champing at the bit. She had an activity scheduled at East High and she was about to miss it. But there was no stopping our meeting the superintendent had one more huge item of particular concern. He had been working with his staff to completely change the organizational chart of the District’s administration. Here I’ll add my two cents. For the past five years it has been new construction that has driven our district. Its not surprising that we took our eye off the day to day running of operations ball. What’s more one of the formerly critical divisions of the District from my day, the Curriculum Department, had been gutted I presume for budgetary reasons. It was down to three people. After reviewing the charts I piped up to explain that from where I stood he was in charge of his administration and I would trust him to figure out how to make it function smoothly. Our meeting eventually came to an end long after Judy Seliga-Punyko’s East plans could be met. As we were putting on our coats Annie hurried over to ask if we couldn’t postpone our meeting. It had already been postponed once before but it was late and I readily agreed. Perhaps we will get together Friday for coffee. At some point I said something about our meeting being a three hour tour and Judy picked up on that and began reciting the verse from the old Gilligan’s Island theme song. I couldn’t help myself but try to remember the passage and sing it out. Everyone my age knew it by heart in the 1960’s. One last anecdote which I found very humorous and I hope doesn’t twist anyone’s knickers. I plan on jollying up my sometimes contentious Board colleagues and will tease them mercilessly, if gently, as time goes on. During our meeting Rosie Judy and I had a short conference over something I’ve long forgotten when Rosie answered a question I tossed to her by saying, “Art…uh Harry…..” I piped up and asked, “Rosie, was that a Freudian slip?” Flustered Rosie explained, “Well Art’s been on my mind a lot lately.” Judy and I both guffawed at that. BTW, I’ve been teasing Art a lot lately too. Kumbayah here I come. I’ve got a Men’s Breakfast at Church in a couple hours. I’m going to see if I can catch a few more zzzz’s. Good Morning. My parents old admonition about food probably applies to politics. Your eyes are too big for your stomach. The City Council vacacancy I’ve already admitted to finding interesting. I wasn’t deterred by the probability that I wouldn’t be seated. In fact I am probably too cavalier about all the times I’ve been denied elective (or appointive) office. My family are more embarrassed by my defeats than I am. The simple fact is that I’ve got a truck load of work to do as it is and I’m always piling more on. That is my short way of apologizing for delaying yet again on starting a series on Charters in the Duluth Area. Since it hints of questions of a sale of Central which are some months off as well as teacher’s negotiations about which I’m still finding my sea legs its not that critical for me to get my two cents out. Instead I am working on diplomatic missions to other School Board members and assorted other luminaries to assure them of my high minded aspirations. Or something like that. All the while I’m still getting myself organized. As I watched the opening of the Putin Olympics last night and took pictures of Duluth’s delightful Anna Ringsred, in the US contingent. She’s a member of our church and grew up in it with my kids. As I watched the festivities I was also sorting through the papers, receipts and documents that I needed to fill out my “final” school board campaign finance report. It was due on Jan 31st. Oops. I’ve been expecting a reminder from the Business Office of its tardy filing. I had to add another roughly $500 in donations (mostly mine) and one last expense. Before that I’d spent the day continuing to whittle away my diminishing pile of papers that accumulated while I ran for the School Board last year. Among the other items I made progress on today was adding numerous clippings to my twenty year file on Duluth School News and tax materials for my Mother for whom I act as her Power of Attorney. I woke up after a good four hours sleep at 3AM and started up the Computer to look over Duluth’s School Board policies. I put in a request for a paper version at our last meeting but since I have no idea when it will arrive I decided to read up on my School Board responsibilities. Its been ten years since I was last on the Board and I thought a refresher was in order and that I ought to find out what might have changed in the decade of my absence. They are all online but I am hopelessly addicted to paper for working copies. I did print out about thirty pages of the 8000 and 9000 series pertaining to the School Board. As I was doing this I also began another long time goal – organizing my passwords. I have slowly acreeted the damn things and made occasional changes so that its become devilishly hard to keep track of them. This has led me to many minor hassles of trying to get into sites for which I’ve forgotten the latest password or username. It will probably take me a month or two to get most of them in a single secret place. I am of necessity an archivist of all the paper that Claudia threatens to throw away upon my demise. Most of it I hope to refer to to write a half dozen books before I join my Mother in her demented dotage. I can’t start them until I’ve got the School Board work in good order. That’ll be a year off at the least. Meanwhile I’ve gotten a new project started. I volunteered to help teach at Lifehouse. Its a fifteen year old center for kids who find themselves in difficulty. Its best known for its drop-in center but its much more as I discovered after a tour last week. I’ve been dreaming about teaching again off and on since I lost my job. I even made a request to the school board when I last served to resume substitute teaching twelve years ago. I was turned down by my fellow board members who based their decision on the Board’s conflict of interest policy. Well, Lifehouse doesn’t present a similar conflict. Besides I’ve been worried that the recent discombobulation of the District has been especially hard on the marginal students. I’m hoping to get some insights volunteering. I’m not quite sure what I’ll do yet but I’m expecting a challenge. I’ve been busy for two and a half hours now and the green tea I fixed myself isn’t keeping me sufficiently alert. I may try to catch a few winks before attempting to the work I meant to start a couple hours ago. Get into my new District email account and see what I’ve got in it. A week ago, before I forgot my password, I had 52 emails to attend to. I’m sure its a longer list now. I don’t want to keep my public waiting. Yawwwwwwn. There will be more blogging in a couple days. What a stupid title I gave this blog post. The story seems to be the same story at either location. The start from scratch, build as if no schools existed approach from JCI didn’t even last a couple of years. They boasted they were building schools for the future. We would “live” in these for years to come and there would be savings to boot. And now there is a lack of classroom space? Are the schools still under warranty? Can the district recoup from this obvious failure to accurately predict even 2 years out what ISD 709 needed? Grant had to be demolished because there was excess classroom space. Well as one astute observer commented, just close the 3rd floor and use the rest. But that doesn’t add the big bucks to JCI coffers. Duluth taxpayers should be mad. They were had. I called up Art [Johnston] after I saw the map at one of the Think KIds meetings and could hardly contain my astonishment. Its going to be very hard for me not to spew caustic commentary across my blog today. What long term planning? I’ll make some lame ironical comment and heave a heavy sigh and go on trying to be a nice guy because road rage won’t fix anything. But if Keith Dixon were to walk in front of my car today I think I’d instinctively speed up. Here’s the map two years into my Board tenure dealing with the fine planning of the recently completed half billion Long Range Facilities Plan: (Sigh! I can’t see anything on the link from the District webpage I just put up. 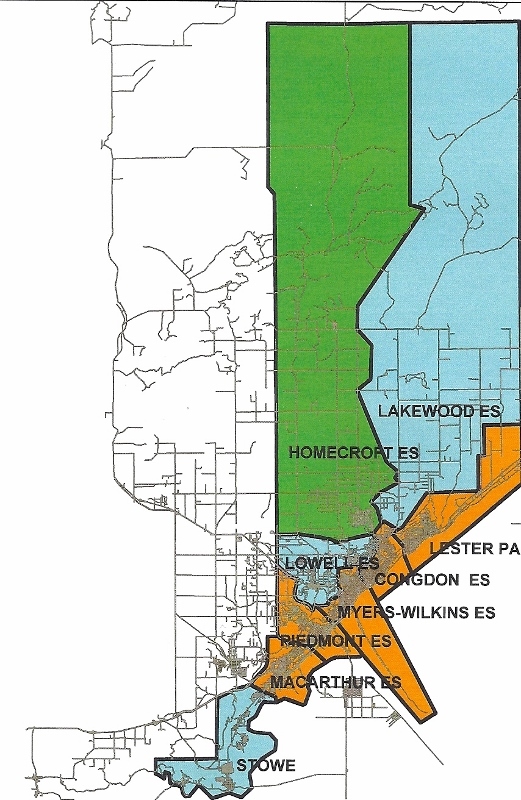 Here’s a jpg I made from the handout for the 2016 School year: The orange color represents overcrowded elementary schools. Green is just right and blue means room for more kids. I was at my third Think Kids meeting last night and our facilitator mentioned that it was anticipated that about a thousand folks would attend the meetings. We had about 25 at the three meetings I attended and perhaps half that at the Denfeld meeting I saw on the news. That would put attendance at about 200. Perhaps these news stories will boost attendance a bit. This ISD 709 page gives the times and places of the remaining meetings. At the Congdon School meeting last night I jotted down some unlikely and unpalatable “solutions” including transfering fifth graders to the Middle Schools (which the District did after the last building boom sending my son to a newly built fifth grade Woodland Middle School Classroom. Except for his incompetently taught band class it was one of the best years of his schooling. One more solution would be to add relocatable rooms to our newly built schools. ha ha- wish I were kidding. Some folks thought our new schools would attract back Edison Children. Apparently the newly designed schools were not built with the necessary capacity to accomplish this. My mind has been racing for six months now thinking of ways to plug holes in dikes even as new ones appear. I’m not discouraged or even daunted but I still don’t see any corners ahead for me to turn things around. On a more humorous note: After I was seated in January I was handed a list of committees for me to request appointment to by our new Chairman, Mike Miernicki. I just wrote a note telling him to put me on any committee that one one else seemed interested in. He put me on the “Transfer Committee.” I didn’t know what it did. Now I do. At the Myers-Wilkens Think Kids meeting the Superintendent explained that he had turned down most of the parental requests to transfer children out of the school closest to their home to a preferred one further away. He smiled as he explained that the Transfer Committee had overturned 90 percent of his “NO TRANSFER” decisions. He patted me on the back and told folks I was now on that Committee. This should be fun. Oh, and I’ll get around to writing about Charters and Drug Testing too and so much more. Patience Please.